The Reed College Performing Arts Building (PAB) consolidates theatre, dance and music programs, originally scattered across the campus, into a new vibrant and cross-disciplinary home for the arts. The facility was designed to create a social and creative community. The 78,000 square foot building serves as an open invitation to explore, pass through, and become immersed in the central commons where community is fostered. 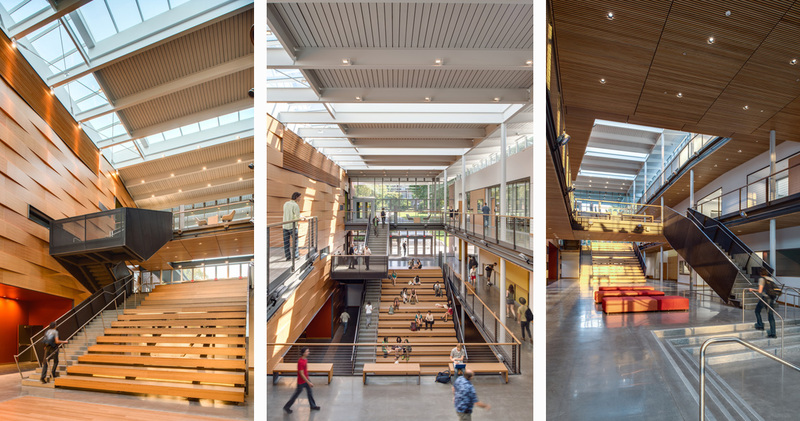 The light-filled atrium, defined by a faceted three-story, wood wall grazed by light, creates a new public front door to campus and terraces up the hillside, connecting to the main campus quad. The completed project cost is $25.5 million. The beauty and diversity of wood used throughout the Performing Arts Building creates welcoming and unique spaces. In the atrium lobby, a faceted wood panel ‘curtain,’ crowned by a continuous skylight, provides an evolving show of shadow and light. The bamboo amphitheater steps create an informal performance and gathering space. In the Music Rehearsal Hall, finely scaled diffusion wood wall panels create a refined intimacy for a piano recital. Reed College uses sustainability as a driving design force, targeting the Earth Advantage Gold Certification. Aligning with this mission, locally harvested vertical grain douglas was used throughout the building. Where durability was paramount, in the amphitheater and for the floors, rapidly-renewable bamboo was used. In the studio theatre, stained wall slats were milled from a red oak heritage tree that fell on campus during a storm, connecting sustainability and preserving memories. For a building featuring five performance spaces, acoustic design was an essential design consideration. In the lobby, angled wall panels diffuse sound, while select panels are perforated to absorb sound. The fir slatted wood ceiling absorbs sound into the black insulation above. The net effect makes the large space feel intimate. In the Music Rehearsal Hall, fir wall diffusers carefully tuned by the acoustician provide an acoustic environment ideal for choir, small recitals, or lectures. The oak slats in the studio theatre conceal the absorption materials behind and provide a base for theatrical rigging. The diverse qualities of varied wood species create a beautiful and highly functional home for the performing arts on campus. – Atrium lobby: Faceted clear vertical grain douglas fir wall panels both solid and perforated and a douglas fir slat ceiling system for the diffusion and absorption of sound. Custom clear vertical grain douglas fir mechanical screen wall. – Amphitheater seating and wood floors: caramelized laminated edge grain bamboo. – Music Rehearsal Hall: Clear vertical grain douglas fir tuned acoustic wall module diffusers, perforated and solid clear vertical grain douglas fir wall and ceiling panels, and caramelized bamboo strand flooring. – Studio Theatre: Custom, site salvaged, stained red oak slat wall system. – Guardrail caps: Caramelized bamboo plywood. – Casework: Clear vertical grain douglas fir veneer and solid stock with bamboo plywood counter nosing. – Custom benches and tables: Laminated bamboo plywood. – Doors: Clear vertical grain douglas fir veneer. – Scene Shop: wall painted plywood wall paneling with plywood flooring – Studio Theatre and Blackbox Theatre stage flooring built up of dimensional lumber and ¾” plywood with a Masonite top layer painted black. – Dance Studio and Performance Lab dance floors built up sprung flooring made of plywood.